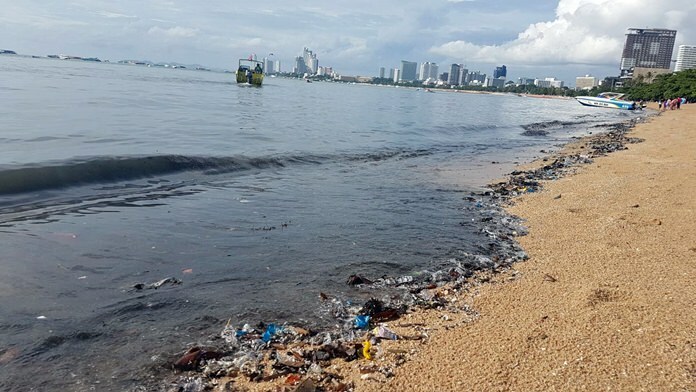 Citizens, residents and tourists alike took to social media to post images of black sand and inky, smelly water on Pattaya Beach near the old pier site near Walking Street. It’s not the first time this has happened. A storm drainage pipe near the site has seen multiple repairs to traps and doors that prevent sewage outflows. It’s possible it is broken again. 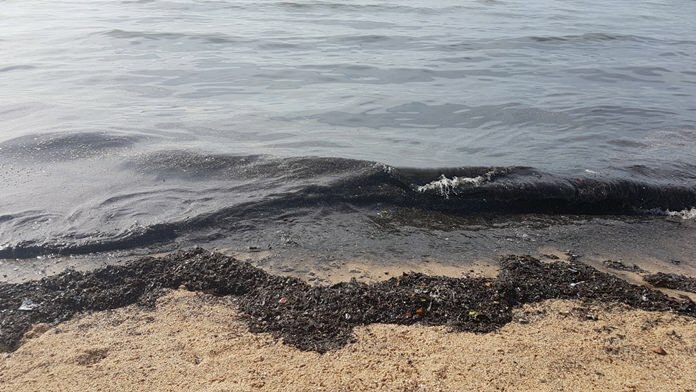 Cleanup began July 15 and officials predicted it would take about a week to clean the beach of raw sewage that backed up and flowed into the sand and sea following a recent heavy storm. 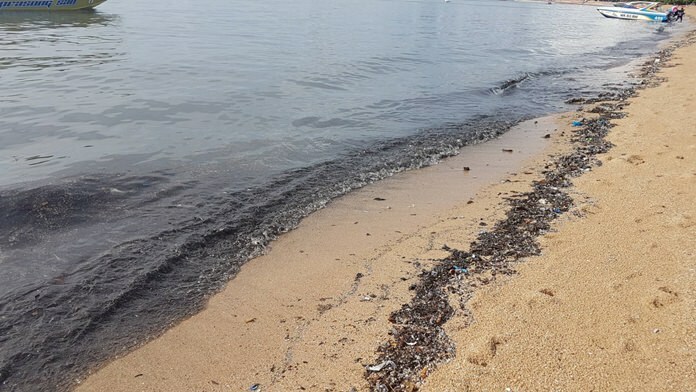 PATTAYA – Citizens, residents and tourists alike took to social media to post images of black sand and inky, smelly water on Pattaya Beach near the old pier site before Walking Street. A check of the beach July 13 found the situation as bad as described. 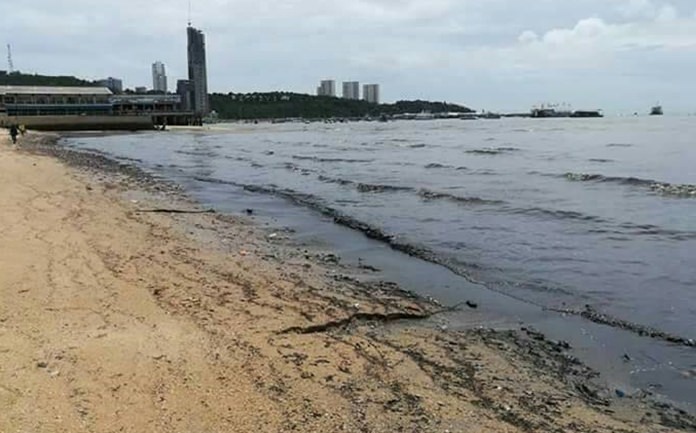 Officials said it would take about a week to clean Pattaya Beach of raw sewage that backed up and flowed into the sand and sea. Water samples are taken for testing to determine if it was indeed raw sewage, but results were not expected for two weeks. 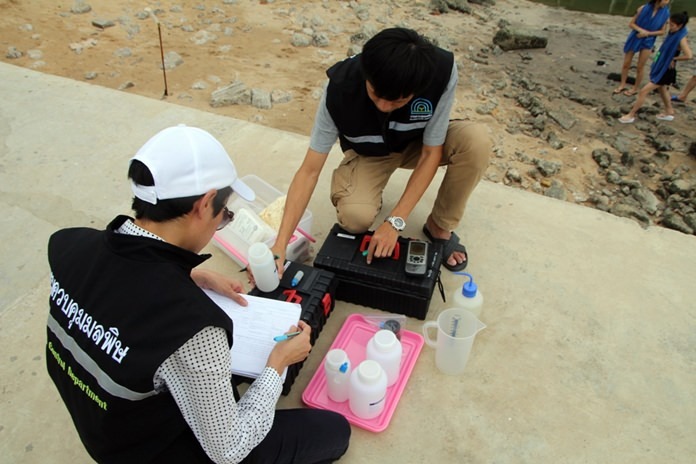 Chaow Nokyoo, water-quality manager for Pattaya’s Pollution Control Department, and Wirat Jirasripaitoon, director of the Sanitation Department, inspected the scene July 15 and ordered heavy machinery to dig up the contaminated sand. Water samples also were taken for testing to determine if it was indeed raw sewage, but results were not expected for two weeks. Social media users had no doubts on the origin of the contamination, however, saying sewage backed up and overflowed into storm-drainage tunnels following a recent heavy storm. A local speedboat operator said the situation was nothing new and has seen sewage spills many times over the years. A storm drainage pipe near the site has seen multiple repairs to traps and doors that prevent sewage outflows. It’s possible it is broken again. Sanitation workers at the scene estimated that 40 percent of the city’s raw sewage was flushed untreated into the ocean during the recent flooding. City hall has ordered a cleanup operation, but it will take about a week to complete. Chaow blamed Pattaya’s 15-year-old sewage treatment system, which could not send sewage to the treatment plant on Soi Nongyai due to broken pumps and heavy storm runoff. Nearly half the city’s sewage, he said, gets into the storm drains and overflows onto the beach. Wirat noted that Pattaya recently was given 27 million baht to improve its wastewater-management system, with many repairs expected to be completed this month. Another 60 million baht has been requested to repair the poorly maintained Soi Nongyai sewage-treatment plant.